SAFFRON Richmond Condo VIP Night Coming Soon! Saffron VIP Night is happening on Friday, April 9th, 2010. A new flavour in Richmond real estate market is brought to you by the award winning builders at Ledingham McAllister! Be the first to preview and select Ledingham McAllister’s newest flavour, the new Richmond Saffron condos for sale! A collection of one to three bedroom Richmond condos for sale located in the prestigious and well situated vibrant city centre, these SAFFRON Richmond condos by Ledmac are truly stunning. Come experience the ultimate urban convenience and luxurious craftsmanship that these new Richmond condos for sale have to offer. Don’t forget to bring your cheque book and ID as you do not want to miss out on the very first opportunity to purchases these presale Richmond Saffron condo homes. Please be sure to bring this invitation for access to this private event, the SAFFRON VIP Night on Friday April 9th. The special event at the Saffron Richmond Condo VIP Night is catered by Golden Sea City Restaurant. Here are the details: Friday, April 9th from 6-8pm. The Sales Centre for the new Richmond Saffron condos by Ledingham McAllister is located at 180 – 8360 Granville Avenue, Richmond, BC. Please contact 604.270.2482 to register for this special VIP Night at Saffron Richmond condos or you can also visit www.ledmac.com/saffron for all the details about this Richmond real estate development. Save Up To $60,000 at Argentum Richmond Condominiums Right Now! Now selling, the show home is now open at the Richmond Argentum condominiums for sale. The price of moving up has just come down, literally! Rising just four storeys, and ready for immediate occupancy, Argentum Richmond real estate condo development is within walking distance of restaurants, shopping malls, two large parks and the new rapid transit Canada Line Skytrain. Plus, the new Richmond Argentum condominiums for sale have all the must haves you want in a new home including spacious floor plans that are open concept, beautiful engineered hardwood flooring, sleek stainless steel appliance set and even elegant granite counter tops. Value priced, the new Argentum Richmond condominiums are ready to move in today. All of the one bedroom and studio floor plan units are now sold out. Two bedroom Argentum Richmond condos for sale start from an affordable price point of $328,800. Two bedroom loft floorplans start from $418,800. The Richmond Argentum Condo Sales Centre is now open on site, so come view the fully furnished displays. Inquire about the available Argentum condos for sale for immediate occupancy by visiting the sales office that is open weekends from one to four. 8400 Anderson Road, Richmond or simply call 604.762/1388. With a limited number of Richmond Centro condo suites available, this new development has NOW SIGNIFICANTLY REDUCED PRICING!!! Hurry in… with only limited selection and HUGE discounts, these Centro Richmond homes will soon be gone. Suite 508 is a 2 plus den in Plan A at 931 sqft and has been discounted to $389,900 ($56k discount) while Suite 3002 isn ow $465,900 ($65k off). In addition, you can move in today! In addition Suite 1702 at Centro Richmond condos is 879 sf Plan G1 and is now $395,000 from $449,900. The one bedroom Plan B Suite 1308 is now $313,900 from $341,900. The developers here is Rize Developments and they have integrated Universal Design principles throughout in addition to building an impressive Richmond Centro SkyGarden that comes with lush green spaces, a covered Teahouse and rasied deck. Located only steps away from the shopping and fine dinin mecca of Richmond real estate city centre, Centro Richmond condos for sale is now launching their final release of homes. Comprised of three unique styles including the TowerHomes, Townhomes and Centro SkyHomes in Richmond real estate, an outstanding alternative for buyers who want two level living but prefer not to live at street level. Great rooms at the Richmond pre-construction condos at Centro feel spacious and open while kitchens are distinctly gourmet savvy with two tone cabinetry that’s tied together by frosted glass inserts and CaesarStone countertops. Ensuites at the presale Richmond Centro Townhomes, TowerHomes and SkyHomes for sale feature Japanese style soaker tubs, dual flush lower profile toilet, and a stylish rectangular sink with single lever faucet. The Centro Richmond condos are priced from just $334,900 plus GST. Centro Condo’s presentation centre for pre-construction condominium sales and display home repon in March at 7080 – No 3 Road (one block south of Granville Street) and 8080 Granville Road in Richmond. For more info, call 604.270.8305 or visit www.centrolife.ca for more information about these pre-sale affordable Richmond condos. Looking for the most desirable Richmond condo development? Look no further then the new Centro Richmond homes for sale with a new display suite now open for viewing. Exceptional pricing, superb quality, true value is now available here at the pre-constructoin Richmond Centro homes for sale. Come in and ask about the RIZE guarantee that the developer has just announced for new homebuyers. The Centro display suite is located at #3006 – 8080 Granville Avenue, Richmond and is open noon to five except Fridays. Contemporary and sleek, modern yet sophisticated, the new Richmond Centro apartment homes and townhouses for sale are truly brilliant from elongated rectangular accents in turquoise and apply green to amazing interiors. The two storey Centro SkyHomes Richmond real estate development feature big homes with high gloss and matte finishes from large balconies from the kitchen and living spaces to the ensuite bathrooms with large soaker tubs (Japanese style) and dual flush toilets for water conservation. The Centro Richmond SkyGarden also is equally impressive with a seventh floor podium that provides a green space for all in addition to an enclosed gym and fitness centre for residents. Developed by RIZE, the Centro Richmond condominiums and sky homes for sale are now open for viewing and present some of the best value in real estate in this city. La Villa Richmond Townhomes For Sale Now! Offering just 28 townhomes in the heart of Richmond BC real estate market, La Villa Townhouses for sale is now showing by appointment only, so there are no open houses or open hours for the presentation centre. A short stroll from the new Canada Line Skytrain station, shopping at Richmond Centre and Lansdowne Mall, plus a fabulous array of restaurants, these pre-sale Richmond La Villa homes for sale feature open floor plans, gourmet kitchens, maple cabinets and private yards in both the front and the back – perfect for families with kids and pets. Plus there’s a lush seven thousand square foot central courtyard that is lushly landscaped for year round outdoor entertainment for residents here at the Richmond La Villa townhomes pre-sale project. La Villa Richmond townhouses for sale is located at 8400 Cook Road in Richmond at the corner of Cook and Eckersley Road. The pre-sale townhome pricing starts from just $260,000 for a one bedroom La Villa Richmond condo suite with an open den or up to $515,000 for three and four bedroom townhouse floorplans. Completion is set for this summer 2009. To book a private showing at the pre-construction Richmond townhomes for sale at La Villa homes, please call Kiat at 604.377.3068 or you can visit lavilla.ca for further details. This is a boutique collection of only twenty eight exclusive Richmond bC townhomes for sale at La Villa that feature heritage inspired architecture and facades in the heart of the growing city. IN addition, the modern interiors and finishes create a perfect blend of traditional looks with urban chic amenities here at the pre-sale Richmond La Villa homes and townhouses. Next to the Canada Line station and close to all the world class shopping that Richmond is so well known for, residents will be able to do whatever they want, when they want to here at this new development. There is a map of the site address online. The new La Villa Richmond townhomes will be built using Rain Screen technology for great weather protection and durability for maintenance free living. IN addition, the pre-construction Richmond BC townhomes for sale present underground parkade that is lit and secure in addition to key fob access. Heavy deadbolt lock hardware in addition to pre-wiring for individual suite security alarms are also standard at the La Villa Richmond pre-sale homes in addition to fire sprinkler system and a 25 year Manufacturers warranty on asphalt shingles (in addition to the National Home Warranty of 2/5/10 years). The bathrooms here at La Villa Richmond will have stunning granite counters in addition to 12 by 12” hand set tiling for the floors. The bathrooms will also have a modern porcelain sink, contemporary nickel finished fixtures, recessed pot lighting or wall mounted lighting as well as designer selected brushed nickel contemporary door know. Residents and homebuyers here at the pre-sale Richmond BC La Villa townhomes for sale will also get sleek contemporary flat panel wood cabinetry in a host of different colours to choose from. The gourmet kitchens at this Richmond BC real estate development featuring family townhomes for sale will also include stunning granite counters with double nosing, designer selected brush nickel hardware, in sink waste disposal, quality stainless steel appliances, porcelain tile backsplashes and accent ceiling lighting. Other kitchen features include open concept functional spaces with large windows, shaker style cabinetry and singe lever faucets standard in every La Villa home in Richmond pre-construction real estate market. The interiors of the pre-sale Richmond La Villa townhomes will include Decora light switch fixtures, large master suites with walk in closets and ensuites, one panel shaker style bypass sliding closet doors, laminate wood flooring and ceramic tiling in addition to future friendly technology. Also, the pre-construction Richmond townhouses for sale at La Villa development will have two innovative colour schemes to choose from with up to 10 foot ceilings and electric fireplaces in every townhome. In addition, there are shaker panel cabinetry throughout and soft carpeting in addition to door casings and baseboards standard in each and every presale La Villa Richmond town home for sale. In suite laundry, and custom fitted horizontal blinds come with your home purchase as well. The new Richmond homes for sale at the La Villa townhomes will offer beautifully landscaped front and rear yards in addition to a weather protected parkade with elevator access. Download the features list from the Richmond La Villa townhome website. Poised to become one of Richmond real estate’s most distinctive low-rise apartment condominium new residences, Saffron Condos will be located on Odlin Road between Garden City and No. 4 Road placing it in the heart of the ever popular South McLennan neighbourhood. Like it’s namesake, the world’s most unique and expensive spice (it takes 75,000 Saffron Crocus blossoms to yield a single puond of saffron spice), this Richmond real estate new development at Saffron Condo pre-sales is destined to be a symbol of sophistication and well-appointed luxury. Designed to accentuate the rich, sumptuous textures of the Asian aesthetic, exocitc colours, luxe fabrics, intricate yet subtle detailing, and high gloss finishes. It draws artistic inspiration from the world’s greatest hotels – W Hotels, Opus Hotel, Clift Hotel. A marriage of tradition rich red with non-traditional turquouise, this eastern inspired new Richmond Saffron condominium homes colour palette touches both young, affluent, and fashion conscious buyers as well as the more conservative, with traditional family values. Life at Saffron means the ability to enjoy the best of all worlds. Here it feels as if you’re miles from the hustle and bustle of the city, yet in reality, every Richmond amenity imaginable is only minutes from your front door. Long known as one of the Lower Mainland’s most upscale fashion shopping districts, Richmond Centre is minutes away from the Richmond Saffron presales condo homes and real estate development community. Dim sum, Asian markets, galleries, and big box retailers wait discovery and exploration. Plus there’s the Richmond library, recreation centre, Gateway Theatre, Minoru Gardens, Richmond Nature Park, Quilchena Golf Course, and even a winery or two to check out near the pre-construction Richmond property at Saffron Condos. Growing families and lifelong learners will be happy to discover a wealth of education facilities as well. From kindergarten to high school, from Kwantlen University College to business and computer training schools, this is a Saffron condos neighbourhood in Richmond real estate market where you’ll never be at a loss for mental stimulation. Thank you for your interest in Saffron Condo Apartments, Ledingham McAllister's latest community in the city centre of Richmond real estate. This contemporary collection of four storey Richmond Saffron apartment residences feature open concept floorplans, luxurious finishes and tranquil greenspace. Saffron's proximity to Richmond real estate city shopping, transit and many recreational facilities is sure to please to most savvy of pre-sales Richmond home purchasers. As a priority registrant of Richmond’s new Saffron condo apartments, you will be amongst the first to receive more information on this exciting new community. Keep your eyes posted for further updates in the weeks ahead. Sincerely, Saffron Homes LP - The Saffron Sales Team. Coming soon from Ledingham McAllister or LEDMAC builders, the Saffron Richmond condos for sale is a collection of one to three bedroom condominiums set in a low-rise building at Park Road near the Richmond real estate urban centre. With a variety of great floor plans available, the pre-sale Richmond Saffron condos will have unique garden terraces and lushly landscaped central courtyard and with the attention to detail that Ledmac provides in all construction, you won’t be disappointed regardless of whether you are a first time Richmond home buyer or an investor or seasoned retiree. For more information about the new presale Richmond Saffron condos by Ledmac, please visit www.ledmac.com or call 604.270.2482. Now selling, the pre-construction Richmond Argentum condos is home to affordable city living. The price of moving up has just come down. Rising four storeys in the heart of Richmond real estate, ARgentum Condos brings a new perspective to condominium living and offers a lifestyle beyond compare. The contemporary pre-construction Richmond urban residences at Argentum Condominiums are situated just a block away from No. 3 Road between two large parks, within walking distance of everyday amenities. Argentum Richmond condo’s 43 finely crafted studio and two bedroom plus loft suites have all the “must-haves” you want in a home: spacious open floor plans, beautiful hardwood flooring, gourmet kitchens with rich granite countertops and sleek stainless steel appliances. Large private balconies, patios and rooftop terraces expand your living space outdoors at the pre-construction Richmond condos at Argentum Residences. Learn more. Visit their website at argentumliving.com. The Argentum Richmond pre-sales condos start from $249,900. Sales and marketing is by Re/Max Westcoast Steveston Real Estate at 12235 No. 1 Road in Richmond BC. The Argentum condos in Richmond are developed by Greypointe Properties Limited and the address of this real estate development is at 8400 Anderson Road in Richmond. www.argentumliving.com. Good Move: Live in the heart of Richmond. Close to your favourite restaurants, shopping malls and karaoke bars. An easy commute to work and school. Surrounded by family, friends and fun. With a pre-construction condo home at Argentum Richmond homes, you’ll be central to everything this vibrant community has to offer. Situated just a block away from No. 3 Road, between two of Richmond’s largest parks, this unique collection of pre-construction Richmond contemporary urban Argentum condo residences offer a lifestyle beyond compare. Great Life: Argentum Condo pre-sales in Richmond real estate stands apart in many ways. Rising just four storeys, it brings a new perspective to condominium living. The 43 finely crafted studio and two bedroom + loft suites give you plenty of choice, and the surrounding neighbourhood invites you to make the most of every day. Shop in the Golden Village and enjoy cultural events. Take courses at Kwantlen University College. Get some exercise playing tennis in Minoru Park, swim laps at the Aquatic Centre, or ice skate at the arena. Spend the afternoon working on your golf swing at the local driving range. Your options at the Richmond pre-sales condos at Argentum condominiums are limitless. Ultra Convenient: Imagine what a pleasure it is to walk to every day amenities from your new Richmond condo home at Argentum development. Meet friends at Richmond Center for lunch and some serious shopping. Borrow books from the Richmond Library. Practise Tai Chi in Brighouse Park. Catch an early movie, then pick up sushi on the way home to Argentum Richmond condo homes. It’s all in your neighbourhood. You’ll hardly ever need a car. Getting to classes at UBC or to downtown Vancovuer is easy with local transit and the future Canada Line nearby the Richmond Argentum presales condos. Urban Style: Argentum Richmond condominium residences is quality built with all the “must haves” you want in a pre-sales Richmond home. Spacious open floor plans make living easy. Beautiful hardwood flooring adds a touch of class. Gourmet kitchens feature sleek stainless steel appliances and contemporary flat panel cabinetry. Large balconies at the pre-construction Richmond condos Argentum residences, private patios, and rooftop terraces ranging up to 1,000 square feet expanding your living space outdoors. Barbecue year-round. Entertain with pride. Curl up by the fireplace on chilly evnings. Or simply relax in peaceful solitude and enjoy laidback weekends cathing up on television and surfing the net. Luxury Awaits: Every detail at the Argentum Richmond condos is designed to enhance your quality of life. Master bedrooms are carpeted to cocoon you in comfort. Bathrooms have granite countertops, designer china vessel sinks, and porcelain tile floors. Master ensuites at the new Richmond condos are luxurious and private with deep soaker tubs. Every Argentum home even has its own washer and dryer. Choose from two designer colour schemes – Manhattan and Malibu – to create a living space that best suites your furnishings and personal style. Home Recreation: Argentum pre-construction Richmond condo homes is more than a contemporary urban residence. Amenities are part of the package. Starty our day by working up a sweat in the exercise room. Hang out int eh social lounge and meet new friends. Make a fresh pot of coffee in the kitchen and read the newspaper outside in the beautiful landscaped garden. Or head up to the Argentum rooftop terrace – it’s perfect for sunny days and starry nights. These thoughtful extras add value and enjoyment to your life here at the new Richmond Argentum condos. The new Argentum floor plans C1a, C1b, E3, E4 and N are online now. Greypointe Properties Limited is a well established and experience Richmond real estate developer. Visit www.argentumliving.com for more details. The price of moving up has just come down a bit more. With the recent real estate market and global economic downturn, the pre-construction Argentum Richmond condos have been reduced. These pre-sale price points now start at one bedroom and studio plans from $238,800 and two bedroom layouts from $328,800. The pre-sale Richmond Argentum condominium two bedroom loft floor plans start from $418,800 and these prices do not include GST. Sales Centre for the new Richmond condos at Argentum is now open, so view our fully furnished displays today and inquire about our available units for immediate occupancy. Located at 8400 Anderson Road in Richmond real estate market, the Argentum pre-sale condos are open daily from 12 to 5pm (closed Fridays). Now accepting priority registration pre-sales, Richmond Mohali townhouses is a collection of 30 pre-construction contemporary townhomes located in central Richmond at 9451 Granville Avenue. All offering three bedrooms plust two and a half baths, these pre-sales Mohali Richmond tonwhomes boast a “playful, modern, exotic” outlook and the convenience of being walking distance to parks, restaurants, and some of the Lower Mainland’s most exciting shopping. Kwantlen University Colleg and the new Canada Line SkyTrain are also easily accessible from your private home residence at Mohali Richmond central real estate properties for sale. Marketing for Mohali begins late spring/early summer. Until then, be sure to priority register for VIP statsus for the central Richmond pre-sales townhomes at Mohali by visiting the web anytime at www.ampri.ca or by calling 604.725.1250. According to the Ampri property developer website, Mohali is coming soon in mid 2008. An exciting new real estate pre-sales project located at 9451 Granville Avenue in Central Richmond, Mohali townhome community will be comprised of only thirty signature and urban chic town houses. Sales will start in the next few months! Thank you for registering with Am-Pri Construction’s mailing list! We have been working diligently for months to get this new system up and running. Your subscription will allow you to receive information regarding Am-Pri’s activities and new real estate pre-sale projects in your community. The new Mohali Townhomes are currently on the real estate market in Richmond. We believe that the location of this townhouse community of Mohali Richmond is the best we have chosen to date. The Mohali Townhomes Richmond property has direct access to McNeil Secondary School, Anderson Elementary School, and a new 21-acre Garden City Community Park. We are currently holding an Open House daily from Noon – 5:00pm (Except Fridays) at Mohali – 9451 Granville Ave. Richmond, B.C. Prices at Mohali range from $460,000 to $490,000 (Net GST Included). Visit www.ampri.ca/mohali for more information. Many of the pre-sale Richmond Mohali town homes in this 30 unit community are ready for immediate move-in. Come and see Mohali or give realtor Jatinder Sandhu a call at 604-725-1250 to arrange a personal viewing appointment. Now complete and ready for move in, the Richmond pre-construction Mohali townhouses is a collection of 30 contemporary townhouses located in central Richmond real estate at 9451 Granville Avenue. All offering three bedrooms plus two and a half baths, these pre-construction Richmond BC homes boasts a playful, modern and exotic outlook and the convenience of being walking distance to parks, restaurants, and some of the Lower Mainland’s most exciting shopping. Kwantlen University College and the new Canada Line Skytrain are also easily accessible from the pre-construction Mohali Richmond apartment residences. Mohali Condos is open noon to 5:00pm daily except Fridays. Fro more information, please visit www.ampri.ca/mohali or call 604.725.1250. A small boutique collection of townhouses are available now in Richmond rela estate at La Villa Executive Townhomes that only number twenty eight for sale. 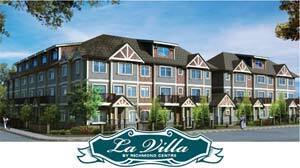 La Villa by Richmond Centre has their pre-sale office at 8400 Cook Road (corner of Cook Rd and Eckersley Road in Richmond BC). For more information, please call 604.377.3068 or visit www.lavilla.ca or speak with Kiat Chang. The new Richmond condos at La Villa Townhomes feature one bedroom plus open den from $260,000 as well as three bedroom to four bed townhomes from $515,000. Inspired heritage style architecture in the heart of Richmond real estate combined with modern state of the art conveniences is what La Villa Richmond Townhomes can provide home purchasers. Just minutes walk to the Canada Line Transite, Richmond Centre Mall, restaurants, Public Market; all La Villa homes in Richmond BC are designed with open concept plans, gourmet kitchens with granite countertops, stainless steel appliances and maple wood cabinets, laminate wood floors, electric fireplaces, high speed internet access; private front and rear years, weather protected parkade, hardi-plank and stone exterior with rainscreen technology system, plus a 7,000 square foot centre courtyard in the middle of the Richmond La Villa new town homes. Completion is due in summer of 2009 at the new Richmond properties at La Villa townhouses.